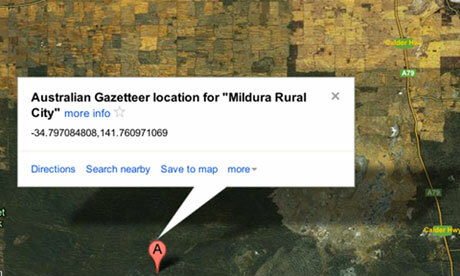 Australian government’s official gazeteer includes area called ‘Mildura Rural City’ at location previously shown on iPhones. Mildura District is a rural electorate located north-west of Melbourne. The city of Mildura is the largest town in Mildura District and is situated on the Murray River. Mildura is the centre of an irrigation area known as Sunraysia, which is known for its dried fruits, citrus and vegetable industries. Other industries in the District include crop farming, fruit, vegetable and wine growing and tourism. Natural features include the northern part of the Big Desert, the Sunset Country and the Hattah Lakes. Apple wasn’t completely wrong in directing Australians who searched for “Mildura” to the midst of the Murray-Sunset National Park – at least according to the Australian government’s official gazetteer, which includes a location called “Mildura Rural City” at the place where Mildura was previously marked on iPhone maps. As first noted by The Register news website, the official gazetteer – which is the authoritative reference for the names and locations of 384,104 places, objects and towns in the continent – contains an entry at the precise place to which Apple was directing hapless drivers until making a hurried correction on Monday. Police in Mildura had warned that using Apple’s iOS 6 maps could lead drivers astray and leave them stranded in the Murray-Sunset park, which at this time of year sees temperatures of up to 47C and has no water and poor phone reception. One man was stranded for 24 hours last week after navigating to the location, which is 44 miles (70km) from the actual town of 30,000. However Apple’s source for its misleading data is unimpeachable: the gazetteer is the official reference. It contains 36 entries for “Mildura”, including the fateful one for Mildura Rural City – which has “official” status and is listed as a “district” (comprising an “agricultural area, county, district, local government area, parish or region”). According to Wikipedia, Mildura Rural City is in fact an area of over 22,000 sq km in the northwestern part of Victoria state – but a gazetteer has to locate every entry at a point, and Geoscience Australia chose one in the middle of the park, rather than in the town. Apple’s mistake though was to ignore another entry for Mildura, which the gazetteer records as having the class of “POPL” – that is, a population centre, even though the gazetter’s explanatory index doesn’t explain that.